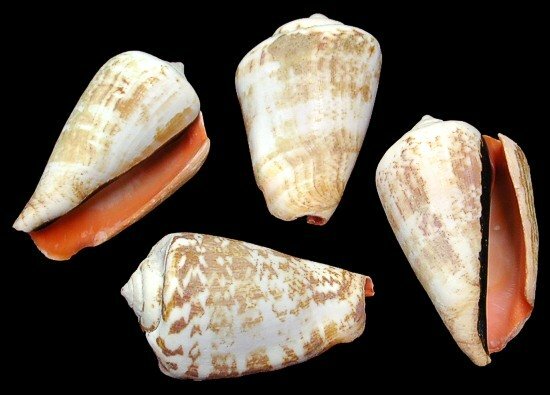 Strombus: common name "true conches"; composed of medium to large sea snails with an operculum. They are marine gastropod mollusks. Scientific family name Strombidae. Most are found in the Indo-Pacific region. True conches have long eye stalks, with colorful ring-marked eyes at the tips. The shell has a long and narrow aperture, and a short siphonal canal, with another indentation near the anterior end called a stromboid notch. This notch is where one of the two eye stalks protrudes from the shell. 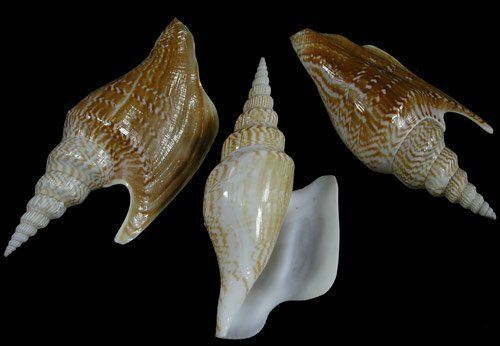 The true conch has a foot ending in a pointed, sickle-shaped, operculum which can be dug into the substrate as part of an unusual "leaping" locomotion. True conches grow a flared lip when reaching sexual maturity. This is called an alated outer lip or alation. Strombus lay eggs in long strands: the eggs are contained in twisted gelatinous tubes. They move with a leaping motion. 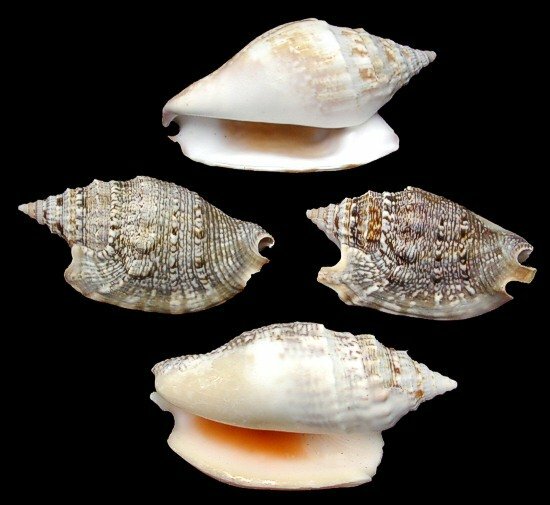 Many species of true conchs live on sandy bottoms among beds of sea grass in tropical waters. They eat algae and have a claw-shaped operculum. Strawberry Strombus shells are gastropods; belonging to the conch shell family. They are a dense, heavy shell. Strombs shells have a flaring lip with a colorful strawberry inter shell color. Most strombs live in shallow, sandy tropical seas. Species: Strombus Listeri. Often called Lister's Conch. The shell is relatively thin, lightweight and slender-spired. The suture is shallow. Its body is smooth with a curved whorl. The apertural lip extends outward. The outer edge is parallel with the shell's axis and ends with a finger like projection. The smooth columella is lightly callused. The spire whorls have strong vertical ribs crossed by finer spiral riblets. 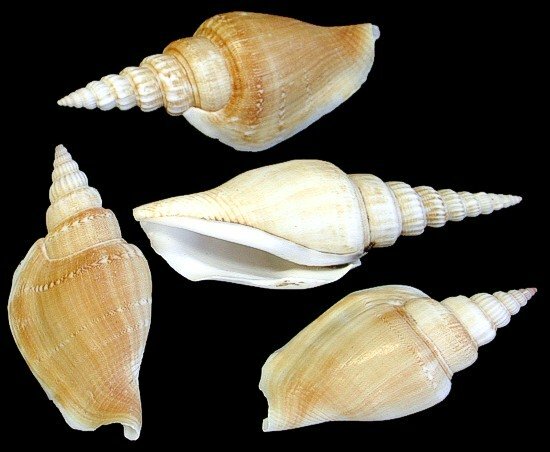 Lister's Conch is white streaked and mottled with brown. The shell was one considered a rare find. These are deep water conchs ranging across the entire Indo-Pacific region; from the Indian Ocean to the northern shores of Australia and New Zealand.